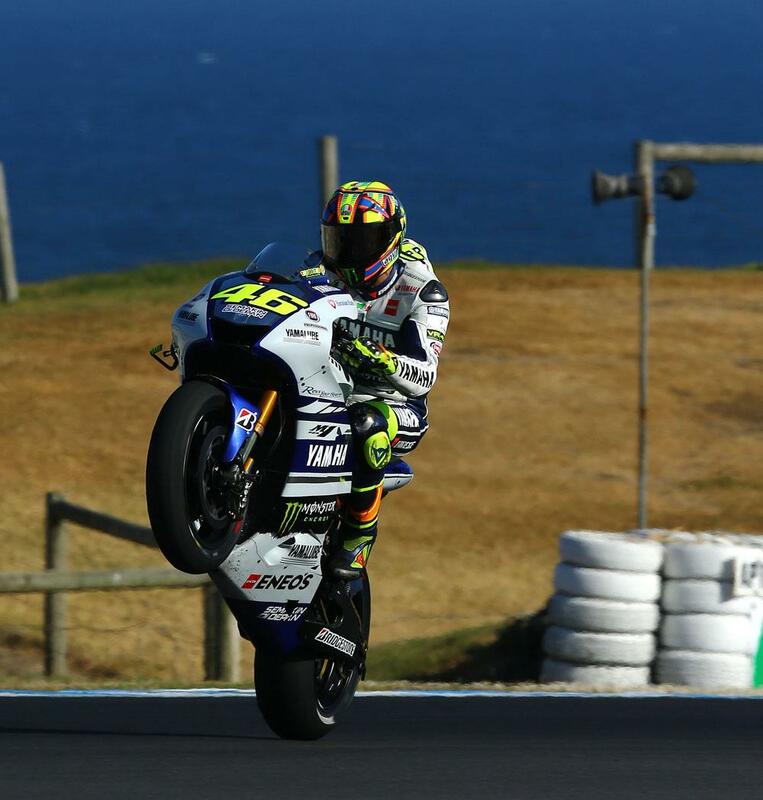 Valentino Rossi declared himself happy with improved endurance from a range of new Bridgestone tyres he evaluated on the first day of testing at the Phillip Island track in Australia today. Rossi is one of a five-strong MotoGP line-up in Australia on a special tyre testing mission for Bridgestone to find a solution to the tyre disaster that struck last October’s Phillip Island race. A new surface wreaked havoc with Bridgestone’s rubber and concerns were so high about excessive rear tyre wear that Dorna approved a historic first dry weather flag-to-flag race, which included a mandatory tyre change. Bridgestone delivered six new spec rear tyres to Phillip Island today and each rider had a specific testing schedule to try and find tyres that offer good performance but improved endurance compared to last October’s race. Each rider started the day on a tyre identical to last year’s race spec for a reference, before they were asked to assess three new versions. All were under strict instructions to run six laps, pull into the pits, and then complete a further six laps on each of the three tyres. Rossi was assessing the same spec tyres as factory Ducati rider Cal Crutchlow today and he finished third fastest with a best time of 1.29.730 in a marathon 85-lap stint. In cloudless skies and warm temperatures, Rossi set his best time of the day on last year’s race tyre, but told MCN: “Jorge and I spilt the work and I found some good things, not about the performance but about the life of the tyre. We have a good direction and Jorge is also happy about the group he tried today. For me the target is try to have the same performance with more life and if we achieve this I will be very happy. It is not possible to have a tyre that is faster and has more endurance. The good thing is Bridgestone is working in the right way to have a tyre that resists for all the race that doesn't lose a lot of edge grip. I tried something not so bad today." None of the five riders on track reported any issues with the race spec tyre that blistered and chunked so badly last October, but Rossi added: "The surface has another five months more and is already less aggressive than October, which means it will be easier for the tyre and this is good news. Usually the asphalt is very aggressive when it is new and then loses the extra grip and this is constant for six or seven years. If this happens here it will be easier for the tyres."